The Yaquina John Point dive site at Waldport is a good place to go if you want to do some crabbing while on SCUBA. It is not a good place to go if you are looking for decent visibility and benign conditions. This dive site is best tackled at low tide so that you will be sucked up into the bay rather than pushed out to sea. Be mindful to not bother the seals that sometimes haul out on the tidal flats. The Yaquina John Point dive site at Waldport is a good place to go crabbing but the viz is never good. Only dive this site at low tide. 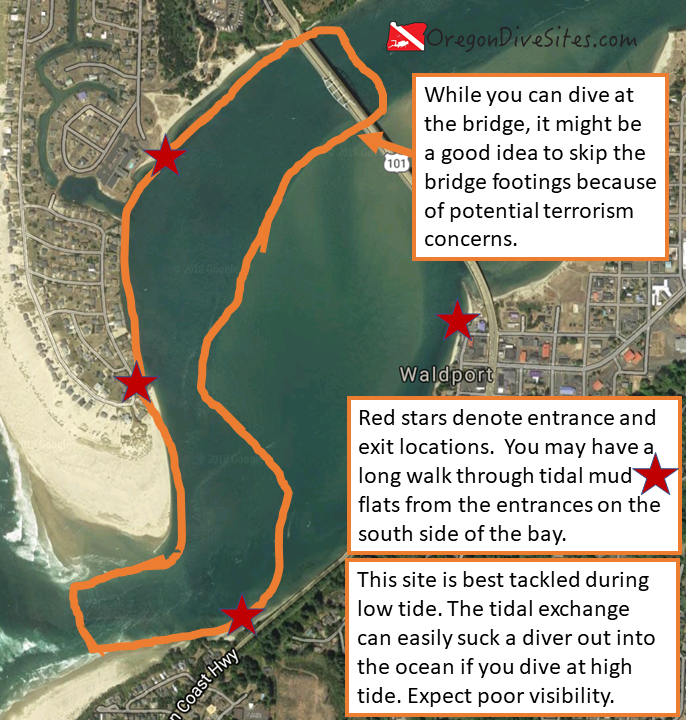 There are four places that you can access the Yaquina John Point dive site in Waldport. To get to the parking area near Alsi Resort, go west on Bayshore Drive north of the US 101 bridge. Bayshore Drive curves to the south. Follow it all the way until it dead ends next to the Alsi Resort and the gravel parking area by the water. To get to the parking area in downtown Waldport, turn west on Spring Street just south of the US 101 bridge. The parking area is along Maple Street. To get to the parking area south of Waldport, look for the small pull-out just as US101 heads south and leaves the bay. To get to the drop off point at the southwest side of the dive site, go west on Bayshore Drive north of the US 101 bridge. Bayshore Drive curves to the south. Follow Bayshore Drive to turn west on Westward Ho Drive. Then turn south on Oceania Drive. Follow Oceania Drive all the way south until it curves around and starts heading north. The road becomes Alsea Bay Drive as it turns north. The drop off point is between the two houses on the east side of the road where you can see the bay and there are some small paths to the water. The three parking areas to access the Yaquina John Point dive site in Waldport surround the site. On the north side, there’s a gravel lot that, when we last checked, is free to park in next to the Alsi Resort. On the east side, there is parking in downtown Waldport. Be sure to check the signs — the last time we parked here, it was three hour parking. The south side has a small pull-out on US101 where one or two cars can fit. There is no parking at the southwest entrance/exit but this is a good place for a friend to drop you and your gear off. The dive site is always changing because the Alsea River is not managed by the Army Corps of Engineers like the improved ports in Oregon. You want to dive in the channel where the water is deepest to hunt for crabs. A few years ago, there was a small channel near the south side of the bay but lately the main and deep channel hugs the north side of the bay. Between the main channel and downtown Waldport is a big tidal mud flat. You will have to slog across the expanse of mud to get to the water. The entrances and exits on the south and east side of this dive site require long slogs across tidal mud flats. It’s not enjoyable but it is one way to get into the water. The entrance/exit for the pull-out area at the southeast side of the dive site is back up US101 where there is a small path down to the tidal mud flats. On the north and west side, the entrances and exits are somewhat easier. You can walk down to the water along some small paths. Then it is a short trip across the tidal area to get into the channel. This is a shore dive. The water is usually too shallow to take a boat out to use as a dive platform. When diving at low tide, the dive will quickly become a drift dive as you get pushed up into the bay. It is a bad idea to dive this site at high tide because it is quite easy to get sucked out to sea if you aren’t paying close attention to your location. Unless you go out over the bar, waves and surf usually don’t penetrate into the bay. There can be some boat traffic going through the bay to do some crabbing or fishing. It’s a good idea to have a dive float that you tow behind you. Expect three to five feet on a very good day. You may find there to be zero viz on bad days. It’s par for the course at Waldport. 48-52F is the typical temperature here. Winter and spring are good times to dive this site although any time of the year it’s possible to get in the water. Depending on what the channel is doing and recent storm activity, you might find water no deeper than 10 feet or water as deep as 35 feet where potholes form. The potholes are often where the crabs hang out. It’s a good idea to have rescue diver training. This can be a difficult dive. We rate this an advanced dive because of the low viz and the likely drift nature of the dive. You don’t necessarily have to dive it as a drift dive but it’s easier. The entrances on the south and east side can be up to 2000 feet from the water across the tidal mud flats. It’s not a very fun walk. On the north and west sides, the entrances are only about 50-100 feet from where your car will be. No surface swim is necessary once you get into the channel. We highly recommend that you only dive this site at low tide. There is a significant risk of being sucked out to sea if you dive at high tide due to the tidal exchange. This is an exposed dive site at high tide because there is no jetty structure for you to grab onto or take refuge behind. The slog across the tidal mud flats is a real challenge. Watch for holes in the sand where it is easy to fall. This is a good site to do a drift dive where you ride the incoming tide up the bay. There are a number of good restaurants both in Waldport and Bayshore. The Waldport KOA campground near the northwest entrance is a good place to base from if you plan to do multiple dives at this site. Otherwise, there are Siuslaw National Forest campgrounds up the Alsea River.